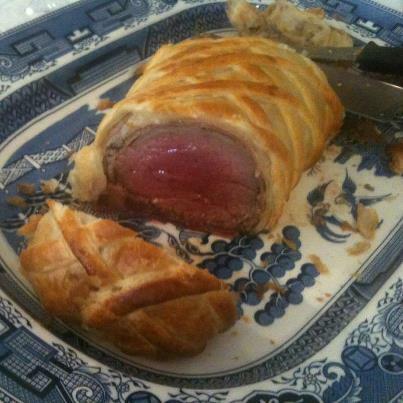 Winter makes me want to cook what I call retro food and what could fit the bill better than beef Wellington. The combination of succulent pink meat and the golden crispy crunch of the pastry is perfect. The only thing I don’t like is when the juices leak through to the bottom of the pastry and make it soggy and unattractive. Also it’s really annoying when the pastry pulls away from the meat. It still tastes great but doesn’t look so good when it’s plated. After doing some research, I can report that it is as easy as, to ensure neither of these things happen, and just look at the result. I cooked this on a rack in the baking pan so that the heat and air circulated around the whole delicious package. I let it rest for a good 20 minutes. Putting the egg wash between the prosciutto and the pastry as well as all around, helps the two adhere together beautifully.